You can feel it in the air, and you can see it in the stores. Winter’s on sale, and Spring is making it’s way in. A change in clothing style means a change to makeup style. Here’s are some of the top trends that stand out for Spring 2012, and they’re are capable of becoming an everyday for you. Shades of Bold: As seen @ Jason Wu, Yves Saint Laurent, Temperley London, and Anna Sui. Lips are a burst of colour in any warm shades of the colour wheel. Anywhere from ladybug reds to cherry to vermillion to electric orange. Take your pick, it will be in trend. Pay attention to texture too. Mattes are always a personal favourite with bold colours, but if you feel this trend is too bold to go matte, yet you still want colour, switch the texture of you lip. Go for sheer lipsticks or glosses in a bold colour. You’ll still be in trend while having the ease of an “everyday” colour with a sheer payoff. Keep the rest of your makeup clean, ie thin layers of base and light washes of colour on the eyes and cheeks. Your lips are supposed to be center stage with this trend. Don’t allow your other features to steal the show. Try MAC lipsticks in Lady Danger, M.A.C. Red, Quick Sizzle, Rebel, and Chanel Rouge Coco lipstick in Paris and Orchidee. Kitty Eyes: As seen @ Dolce & Gabanna, Ruffian, Giorgio Armani, and Badgley Mischka. The classic winged out eyeliner takes a modern twist with placement, intensity, and colours. This is one of my fave makeup techniques because it reshapes the eye to a perfect almond shape, which is considered ideal. Line your entire lash line and flick the ends up. Or just line half way through your lash line and flick the ends out, not up. Make it a long wing, or keep it small and cute. It’s up to you. Liquid liners are not needed. If you’re more comfortable using a pencil or eye shadow and an angled brush, rock it out. But have some fun with this trend and dabble in colour. Navy, teal or grey are personal faves. It’s a little splash of colour that isn’t as loud as an entire eye covered in teal shadow. Try L’Oreal’s HIP Studio Secrets Professional Colour Truth Cream Liner in Midnight Blue or Teal, or MAC Fluidline in Added Goodness. 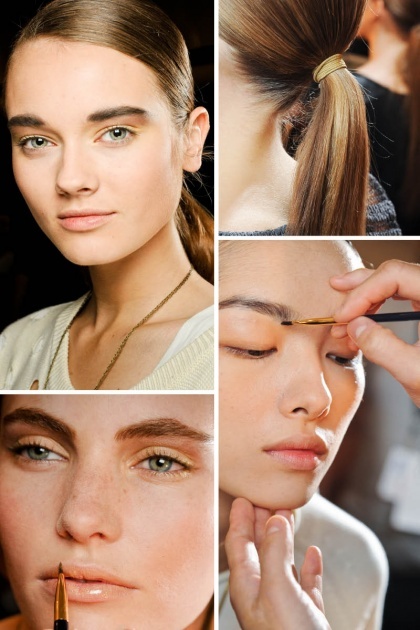 Full Brows: As seen @ Derek Lam, Jill Sanders, and Burberry Prorsum. Lay down the tweezer. Let your brows grow out a bit and channel Liz Taylor from back in the day. Full brows give off a healthy appearance to the face, and it frames and lifts the eyes perfectly. Nothing perks up the face better than a banging arch of the brow and some soft pink cheeks. Experiment with different products to achieve the look. Use either brow pencils, brow gels, or eye shadow and an angled brush. Easiest way to fill in the brows: Start at the arch, at the bottom, and fill in that area to the ends. This part of the brow is usually where most people are sparse. Towards the front of the brow, there is more hair growing, so just blend out towards the front. If you like the very front of your brows bold, fill that in too, but whatever you do, DO NOT square off the brows. No geometric shapes on the face please. Silver Wear: As seen @ Chanel, Phillip Lim, and Ralph Lauren. 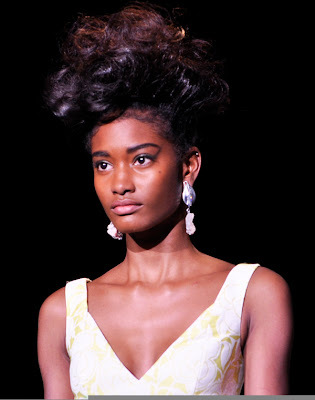 I recently did this trend backstage for Alberta Ferretti, and it was beautiful. Ferretti wanted a slight twist to it and asked for a minty silver, which looked really fresh with a soft peach cheek. It looked similar to what was seen at 3.1 Phillip Lim’s show, with the silver just washing over the crease only, nothing on the lid. Or you can take inspiration from Chanel and have a wash of sheer silver across the eyelids and rim the eyes with black liner, smudging it softly. Either way you decided to place the colour, just make sure it’s sheer. No disco eyes with this trend. Cream shadows work best with this. If you’re not a fan of those, then just keep your pressure gentle on your eye shadow brush as you apply. Try Make Up For Ever’s Aqua Cream in Steel or Snow, or MAC Paint Pot in Bare Study or eye shadows in Retrospeck or Crystal Avalanche. Rosy Kissers: As seen @ Peter Som, Carolina Herrera, Oscar de la Renta, and Balmain. Probably the easiest way to stay in trend, and I honestly don’t see this trend disappearing anytime soon. Have lips mimic colours you’d see on pink & cream coloured roses. The textures are sheer and slightly moist, not super glossed up or matte. Easiest way to stay on point with this trend is to dab the colour on, don’t swipe straight from the tube. That applies too much pigment. Pair your lips with blush that matches in shade, and you’ll look fresh-faced going into Spring. This is also the best look to do on you face if you’ve had a long night, or partied to hard! Try NARS Velvet Gloss Lip Pencil in Frivolous, the cult classic Rose Buds Salve, or MAC Sheen Supreme lipstick in Happy Hibiscus or Blossom Culture. 2 comments on "Spring 2012-- Makeup Trends"